Author(s): Rainer Schneider. RECON – Research and Consulting, Unterer Mühlenweg 38 B 79114 Freiburg, Germany. Objectives: A new information medicine device (Vita Chip) was tested regarding its ability to alter pain dynamics and wellbeing. The Vita Chip is designed to store healing information and to resonate with cells. Methods: Two prospective documentation studies were carried out with individuals suffering from various forms of chronic pain. In both studies participants applied two Vita Chips on the pain sites for one hour on each day pain occurred. In study 1, the effects were tested against a natural control condition (crossover design). In study 2, a (pseudo) placebo device was employed in one condition to test for placebo effects. Main dependent variables were pain intensity, onset of pain relief, pain duration, and wellbeing. Results: In both studies, the Vita Chips produced large pain reduction effects (Cohen’s d). The changes in onset of pain relief, pain duration, and wellbeing indicated high practical relevance. The reduction of pain intensity was not due to placebo effects. Instead, the specific effect outperformed the unspecific effect by more than 150 percent. Discussion: The pattern of results suggests that the Vita Chip produces practically relevant pain alleviating effects. It constitutes a safe and effective alternative for pain management in subclinical individuals. Keywords: Information medicine, mood, pain management, vita chip, well-being. Affiliation:RECON – Research and Consulting, Unterer Mühlenweg 38 B 79114 Freiburg, Germany. Keywords:Information medicine, mood, pain management, vita chip, well-being. Abstract:Objectives: A new information medicine device (Vita Chip) was tested regarding its ability to alter pain dynamics and wellbeing. The Vita Chip is designed to store healing information and to resonate with cells. Methods: Two prospective documentation studies were carried out with individuals suffering from various forms of chronic pain. 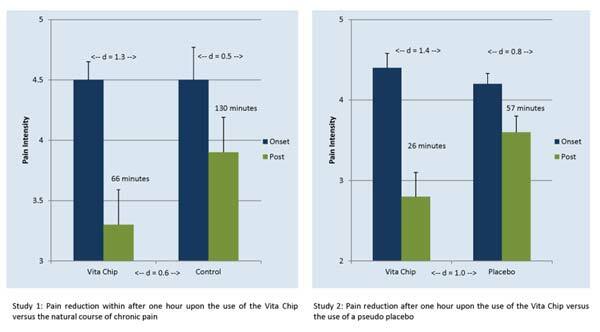 In both studies participants applied two Vita Chips on the pain sites for one hour on each day pain occurred. In study 1, the effects were tested against a natural control condition (crossover design). In study 2, a (pseudo) placebo device was employed in one condition to test for placebo effects. Main dependent variables were pain intensity, onset of pain relief, pain duration, and wellbeing. Results: In both studies, the Vita Chips produced large pain reduction effects (Cohen’s d). The changes in onset of pain relief, pain duration, and wellbeing indicated high practical relevance. The reduction of pain intensity was not due to placebo effects. Instead, the specific effect outperformed the unspecific effect by more than 150 percent. Discussion: The pattern of results suggests that the Vita Chip produces practically relevant pain alleviating effects. It constitutes a safe and effective alternative for pain management in subclinical individuals.